Des chambres coquettes où l'on se sent bien ! La piscine de l'hôtel… une invitation à la détente. Le plaisir de la table accompagné d'un vin de Cahors. 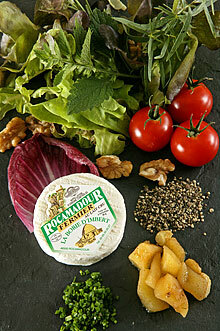 Savourez la cuisine du Quercy dans une salle au décor raffiné. The hotel** Le Petit Relais, near Rocamadour and Padirac, offers all the comfort and facilities of a family run 2 Star hotel and restaurant with swimming pool. The perfect place for a short break or a longer stay in Quercy-Lot. This family hotel is situated in Calès, an ancient ‘Bastide’ village, typical of this picturesque region, at the heart of the Quercy National Park, but just 5km from Lacave caves and the Dordogne Valley, 13km from the world-famous village of Rocamadour and 28km from the prestigious Padirac caves. The Chef features an abundance of quality Quercy-Perigord regional produce, combining traditional culinary skills with his own modern twist. We can also cater for large events and gatherings. Lying at the heart of the Souillac – Gramat – Gourdon triangle and with Rocamadour and Dordogne’s tourist honeypots on our doorstep, the pretty village of Calès remains a peaceful haven. Here, Le Petit Relais offers a quiet night’s sleep in comfortable bedrooms and excellent food served in our stylish restaurant or in fine weather, on our shady terrace. We also have a pool and garden for your relaxation and enjoyment. Karine and Olivier look forward to welcoming you and offering their warmest hospitality. We always do our utmost to make you feel at home, so you can relax and enjoy this very special area of Aquitaine, leaving with happy memories of your stay in South West France, to last you until your next visit. We are happy to welcome you for a new gourmet season, and to announce that we are lucky enough to have joined the team of “Bonnes tables du Lot”, pledge of quality and friendliness, where we were warmly received!!!! Keep up to date with our news and special offers when you’re thinking of a weekend away or perhaps planning a special occasion with friends and family. Book a hotel room near Rocamadour, Lacave and Padirac caves in the 2-star Hotel Restaurant with swimming pool Le Petit Relais in Calès (Lot Quercy). 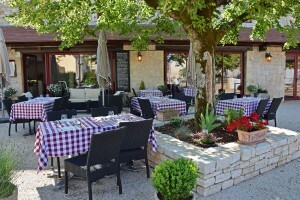 The Hotel Restaurant Le Petit Relais is situated in the Lot, at the heart of Quercy, close to the medieval city of Rocamadour (2nd tourist place of interest in France) and proposes you the charm of its 13 comfortable hotel rooms, terrace, garden and swimming pool.